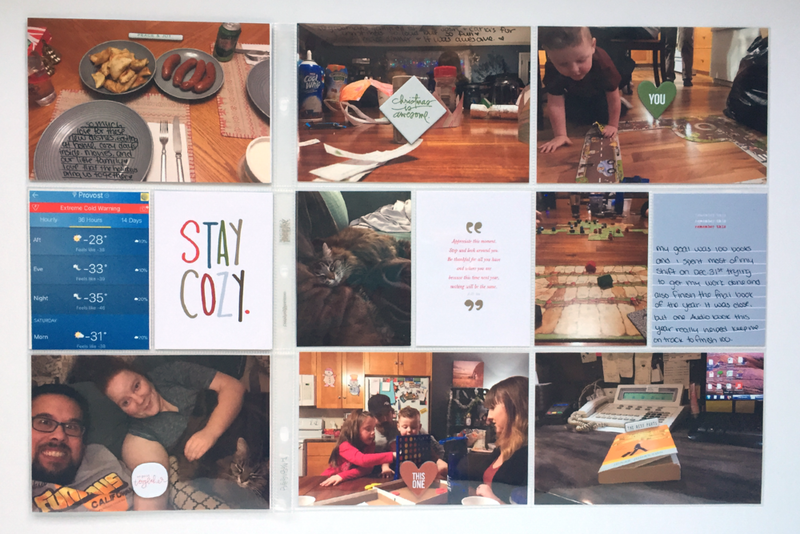 This week encompasses two family gatherings, so I threw in an insert to finish off the year. I love how bright and fun this week is. Christmas is hands down my favourite holiday. The left side with the insert. 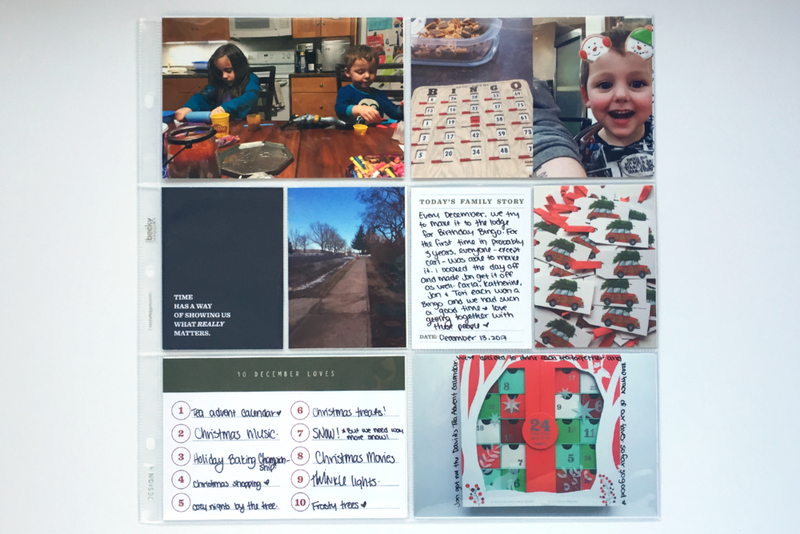 I used more December Daily bits, and the December 2017 digital kit (here). The front of the insert covers babysitting my niece and nephew. We built lego's, made some crowns and had a pajama photoshoot and built a ridiculously hard puzzle. I added chipboard pieces throughout the week. Here's a closer look at the left side. I added a label to the title card with some phrase strips from the December Daily main kit. I struggle to use the chipboard that comes in the Story Kits. It's just something that I tend to hoard because it's either too pretty, or it needs the perfect photo. One of my goals towards the end of 2017 was to stop hoarding it and just use it. There would never be a perfect project, wherever it went would BE the perfect project. It helped me actually use my stash and I managed to empty one entire sheet of chipboard. The back of the insert was about it being ridiculously cold and making dinner then watching a movie. I told a similar story in December Daily and included our "awkward" family selfie. Here's a better look at the right side. More chipboard pieces across the spread. Love that quote card - that I think came in the digital December kit I linked above. I could have included more photos, but I feel like these capture the stories I wanted to include here. I wrote a lot more in December Daily from our Christmas gatherings, so I feel like this is enough for this album. Ali talks a lot about NOT including every single photo, and I absolutely agree with that. It took me a couple years to figure it out, but I don't want to have to worry about dealing with 60 albums later in my life, so I'm actively choosing not to include every photo. I also don't even really take that many, so sometimes I include every photo because that's all there is. Here's a look at the spread without the insert. Even this would have been an adequate look at our week. Big love for this spread. It was just before Christmas, and yet the only thing REALLY Christmas related, is the gifts under the tree. Still love this one. Using old and new December daily bits, and pieces from the Give Story Kit, and this journal card set. 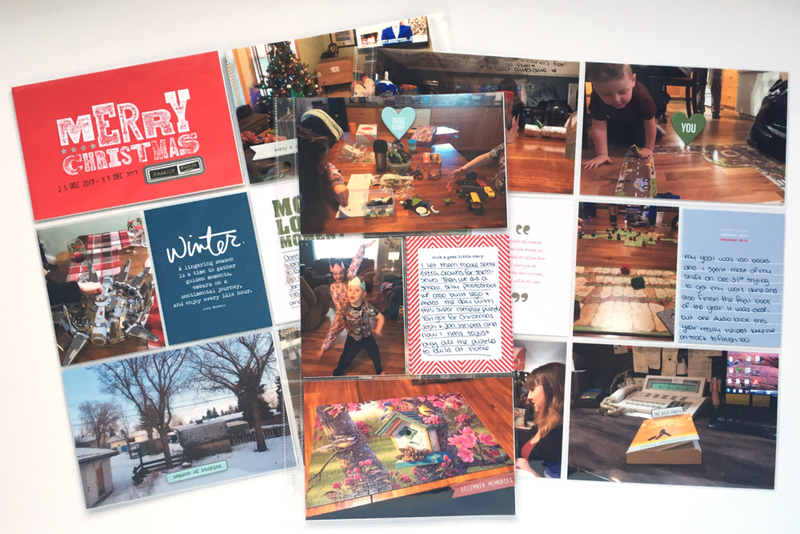 Some of these photos are repeats from December Daily, but I have absolutely no problem scrapbooking the same photo over and over again. The words are never exactly the same, and I sometimes try to look at the story from another perspective, but sometimes I just repeat myself, which is absolutely something I do even outside of memory keeping. Still love that wrapping paper, the snow, Gracie photos and sunsets. I had intended to include more photos of myself throughout the album this year, and I included some, but I don't remember even taking that many of them, so of course I included this selfie that I also included in December Daily. Where did January go? I feel like the month has just flown by. I haven't started documenting this year yet, but I'm working n it. Why is a title page always the hardest part? I know I shouldn't let it stop me, but for some reason I feel like I need to sort it out before I even think about putting together week one. But first, I'll finish sharing 2017. Here's Week 50. I debated doing the weekly backyard photos again this year, but I think instead I'll put together a layout covering all of them from 2017 and call it good. This week I made new gift certificates for work and babysat my two favourite littles. The "we do" card is from this set by Ali Edwards. 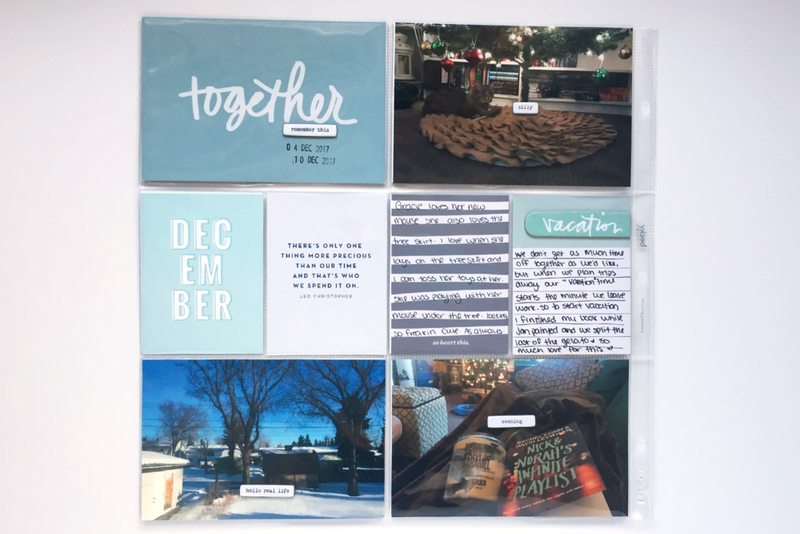 I didn't have enough photos, so I used a 4x6 card from a December Daily kit to document some things I love about December, even though we have basically no snow. Sometimes I also collage to 3x4 photos together, like the top right. We went to visit my Grandma at the lodge and play Birthday Bingo. For the first time in a couple years, most of the family was all able to make it. So fun. This spread is so BLUE and I love it. 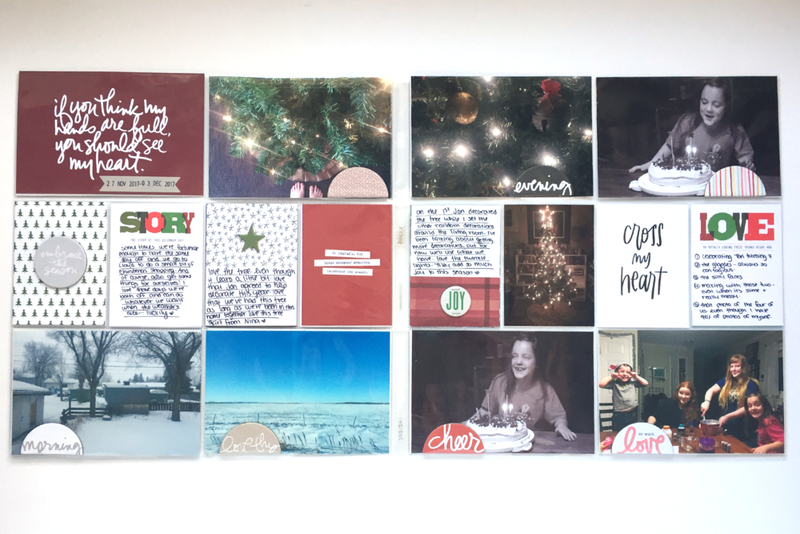 I used some cards from my December Daily stash, and I printed a few digitals from the Time Story Kit. Repeating the chipboard embellishment formula using the phrases, and the vacation piece from this chipboard bundle Ali released this past summer. I love how simple the middle row feels with mostly words. Sometimes I feel like my title card also creates a sort of "theme" for my weekly spreads. Like this one says "together" and most of the stories I told this week, are about us being together. With Gracie and with each other. 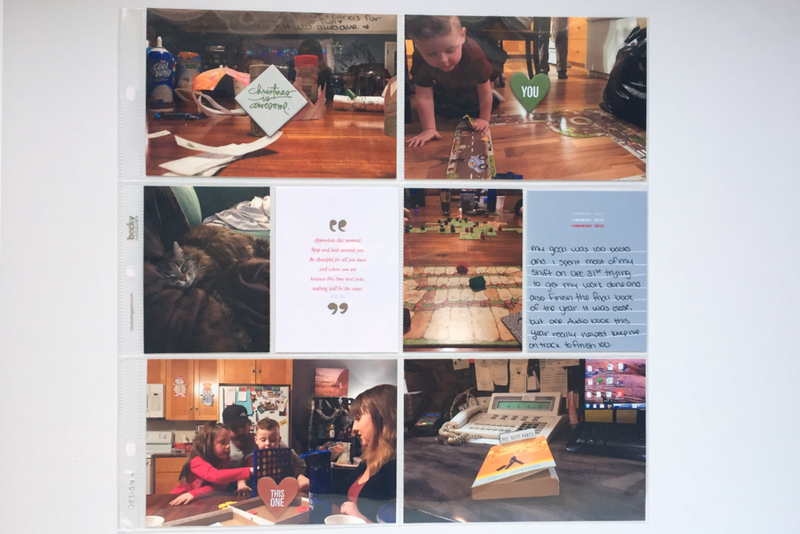 I added a chipboard phrase strip to every photo that corresponded with that photo. The right side basically covers the weekend for us. Gracie photo, zoo lights, a day of relaxing in the hotel for me while Jon's at a tournament and the drive home. I love that this spread is just simple. The stories were straightforward and having a formula for adding embellishments makes things so much faster. I love this spread. All the reds and greens and those chipboard half circles. I love this project, and I love the month of December. The date card on the top left is from THIS card set by Ali Edwards. The "cross my heart" card is an old Feed Your Craft and the rest were from various December Daily kits. Somehow, despite all the embellishments, this spread looks really clean. I love the repetition of the circle/half circle. I'm also proud of myself for using my stash of December Daily cards, and the hoard of chipboard pieces I think are too pretty to use. I always find those half circles so hard to use, but I made it work here. I aligned them in a way that when the pages were in the album, the chipboard pieces wouldn't be stacked on top of each other. I super love that cross my heart card. Brandi Kincaid makes really great stuff for Feed Your craft, but she also has her own shop HERE.